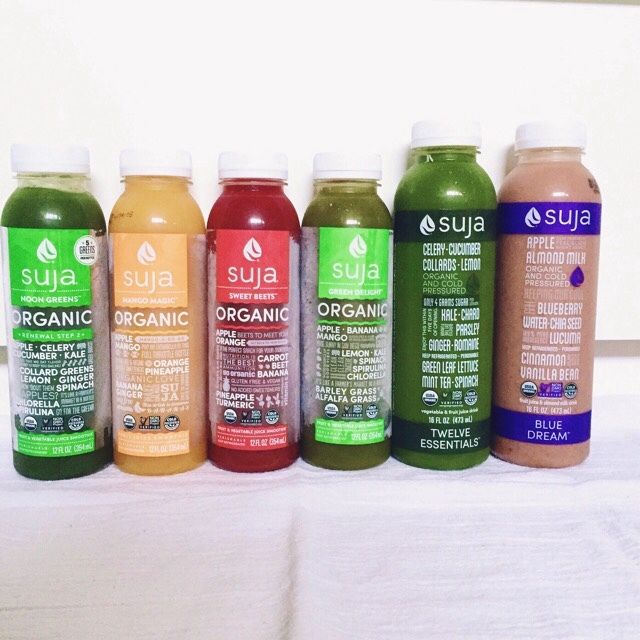 I have been drinking a lot of the juices that Suja gave me, so I didn't have the exact juices for the suggested cleanse, so I make-shifted. They go in order of how they are pictured, from left to right, morning to evening. 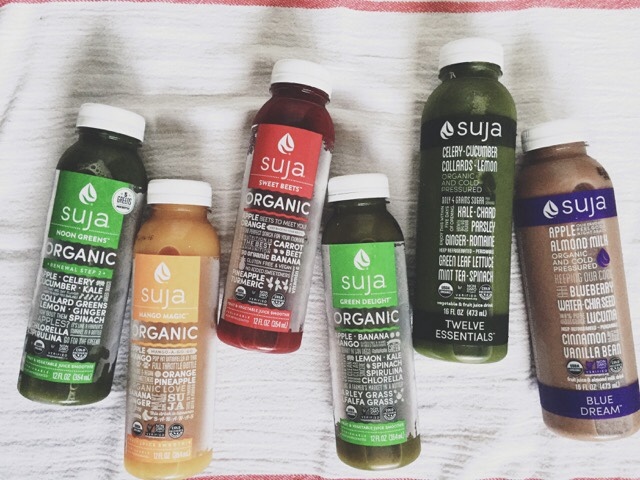 Before I began my juice cleanse, I did some research on juice cleanses. Some people supplement raw fruits and veggies, or some nuts in with their juice cleanse, so I decided to supplement some of my favorite fruits and veggies in with my juice cleanse. 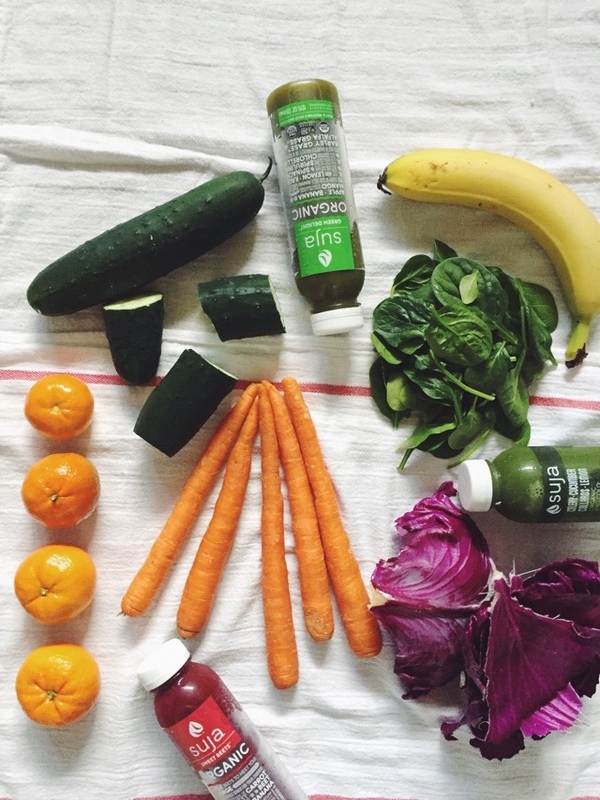 I also read that it is a really good idea to keep hydrated during the cleanse. It is a good idea to keep hydrated everyday. I have been doing better about drinking water lately, but yesterday, I rocked it! I decided to supplement spinach, cucumbers, bananas, clementines, carrots, and red cabbage in with my juice cleanse. It is easy eating red cabbage in a salad, but downing it raw, and by itself, it's rather difficult. I am just getting into loving veggies, and raw red cabbage is not a favorite, but I like the benefits of eating red cabbage. 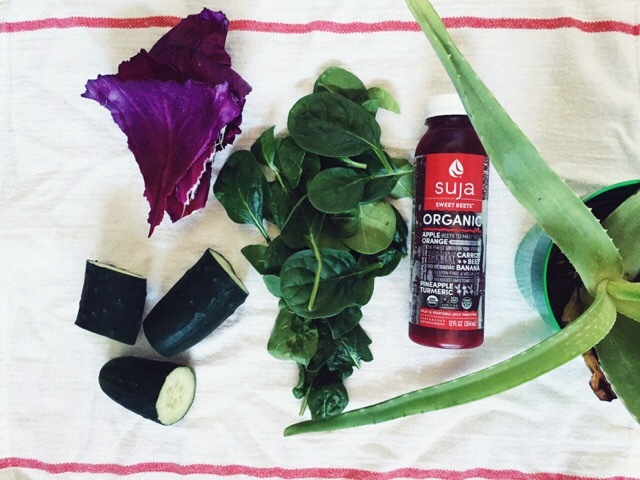 For breakfast, I actually had Suja Juice's Noon Greens. 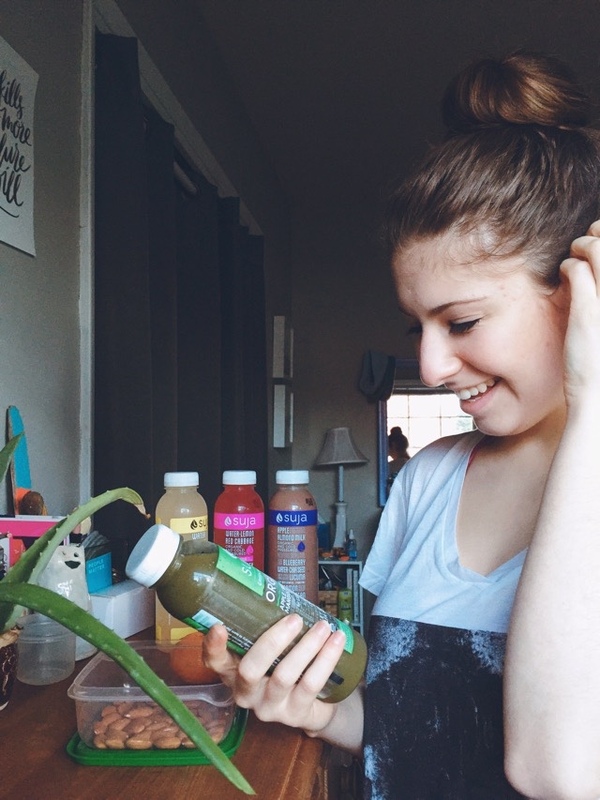 It was in place for their Glow juice that is supposed to be the first juice of their cleanse system. I compared the ingredients, and Noon Greens had a lot of the same ingredients that Glow does. I also had a banana, a couple of Cuties (clementines) and a handful of almonds. This actually kept me full for a while. I didn't feel hungry when I went on my errands, or when I came back from my errands. I felt energetic, and I didn't feel heavy. I really don't like that feeling of heaviness after I eat. I also consumed half of my 750 ml Camelbak water bottle with breakfast. In between breakfast and lunch, I had Mango Magic as my mid morning fuel, and I also had a banana, and the other half of my water bottle. Bananas are more filling than you think. I kept time pretty well too, I always drank my juices at the 20th minute of each hour. That is just how it worked out. At 1:20, I had a late lunch of Sweet Beets that I used in place of Purify juice. I had two cups of spinach, four red cabbage leaves, and a whole cucumber, along with another half of my water bottle. This was also a very filling lunch, and Sweet Beets is one of my favorite juices! I also loved Purify, that had beets in it too. I am a total beet gal. In between lunch and dinner, I had the Green Delight juice as a snack, with another 350 ml of water. I never felt hungry until the end of the day. I had a meeting at work that lasted a little longer than I thought it would, but I took my Twelve Essentials juice to the meeting to get started on my dinner. When I got home, I downed the Twelve Essentials. That particular juice is really hard to drink. It is kind of bitter, but I know it is probably the best juice for me because it has a bunch of good greens in it. For dinner, I had a whole cucumber, a cup of spinach, a few carrots, and four red cabbage leaves. I also finished off my third 750 ml water bottle with dinner as well. By this time, I was wanting more than just fruits and veggies, but I kept strong. 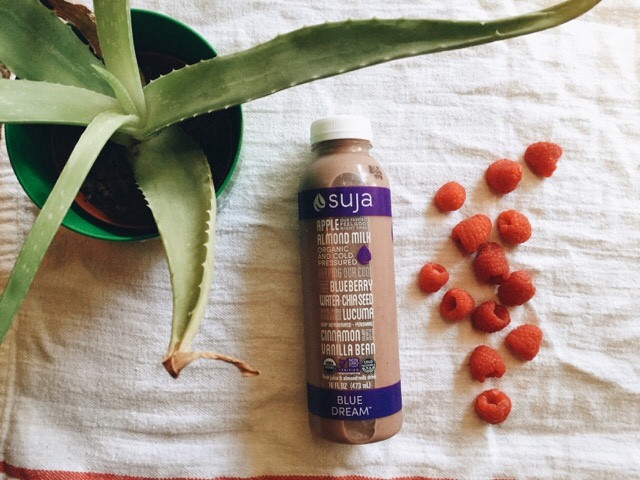 For dessert, I had Suja's Blue Dream. Eeee... This juice is not my favorite, but it definitely treated my sweet tooth. At night, I get the worst sweet tooth, and I usually suffer if I end up eating sugar after 8:00 pm. It builds up stomach acid and it burns. The Blue Dream never gave my stomach a burning feeling, and even though it wasn't the best tasting beverage, it made me feel awesome after I consumed it! I also had a little handful of raspberries along with Blue Dream. 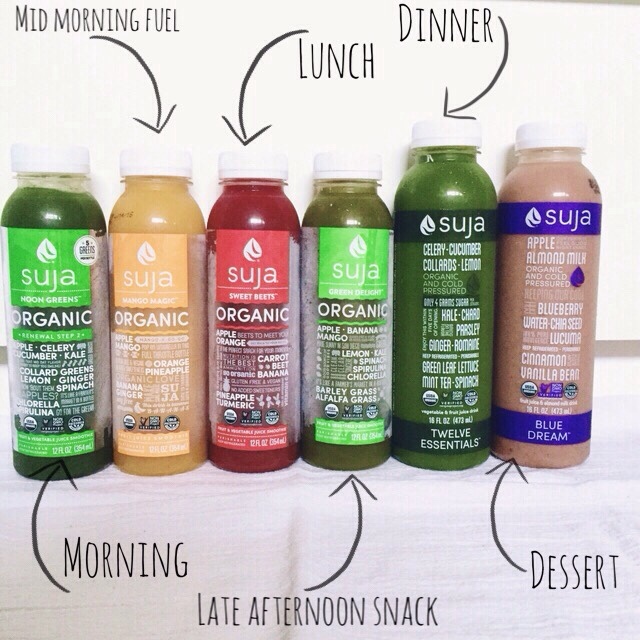 This completed my one day cleanse! After just one day of having fruits, veggies, and juice as my diet, I noticed some subtle changes. My skin is glowy, my hair is softer, and I was definitely more energetic yesterday. Ever since I have integrated more and more raw fruits and veggies in my diet, I have felt far more energetic. But yesterday, I was so energetic! I was really proud of myself! 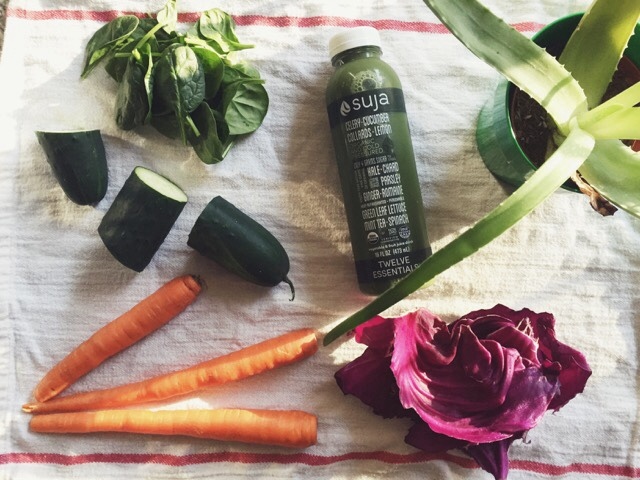 A juice cleanse is not as easy as it sounds, but my motivation was the pride that I was going to have in finishing the cleanse. Next time I do a cleanse, I am definitely going to grab up the correct juices for the cleanse, and some different fruits and veggies, maybe some melon and grapefruit. Yesterday was a real eye opener to my health. I was scrolling through social media, and saw pictures of junk food, and chips, and food with a ton of sodium and fat, and it actually grossed me out. I have not eaten fast food in over two years. I have not eaten store bought crackers and cookies (that aren't organic, low in sodium, and non-GMO) in over 9 months, and I been so good about integrating fresh fruits and vegetables in my diet. I am super choosy about my food now-a-days, and I am going to continue to think about my food before I eat it. I read nutrition affirmations, and they are really helpful in helping me keep up with my health and wellness. I make conscious decisions about what I eat, and what I drink. I love this journey that I am on to eliminate harsh, and unsafe chemicals from my home, and to promote health and wellness with my food and my actions. It is almost the weekend! What healthy goals do you want to complete this weekend? 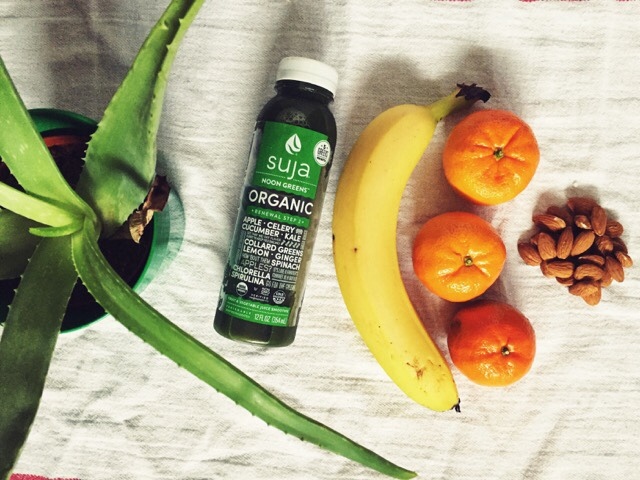 This post was sponsored by Suja Juice. All opinions, experiences, and photos are my own. Attempt this and I will influence one to ensure, it will transform you and your families lives for the better in your opportunity spent here on earth.